People normally club together Batterie D'azeville and Ferme-musee Du Cotentin while planning their visit to Airborne Museum. Great museum. Very successfully illustrated and communicated also through tablets - for a few seconds you can imagine how it was to be there - before being reminded you have no imagination of what it must have been like. Deep respect for these men. Really good museum. Focuses a lot on individual stories as well as an overview of the whole battle. There is an interactive Ipad you get given when entering the museum. I didn't use this. Lots of good artefacts. Would definitely visit again. Great museum with a lot of history and items. The tablets are breaking the immersion though. Try to come when there is not a lot of people because they prefer to watch their tablet instead of looking real objects. Despite this little problem it's still one of the best museum about landing. St. Mère Église is lovely. As an American military family visiting, great experience for all!! My six kids enjoyed it, they give you an interactive tablet and the kids loved it. We really enjoyed it!! 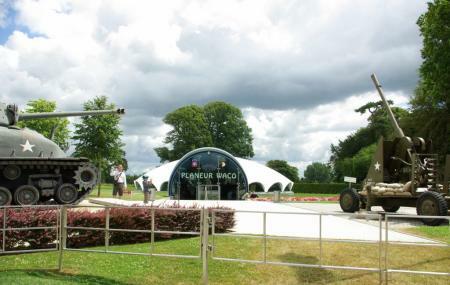 Reasonable prices and a must to see if visiting the beaches of Normandy. Veterans of both the 101st & 82nd....have to see!! The area is very cozy, even during off-season (March). Stop at the craft beer shop in town for 82nd beer. See the church with the paratrooper stuck. Great visit!! Recommend!! Best museum from WWII. A truly must see!